A U-Haul truck crashed through a wall of a San Diego County office building in Kearny Mesa on Monday. The truck slammed into the County Health and Human Service Agency building on Ruffin Road at about 6 a.m., forcing the department to cancel appointments Monday. The driver took off after the crash and left the truck behind. Police are investigating the incident as a possible intentional act. An expletive-ridden message regarding treatment of veterans was written in white spray paint across one side of the U-Haul truck. It was unclear what caused the truck to go into the building but significant damage was done to the main entrance to the building as well as to the top of the U-Haul truck. The county estimates the cost of the damage is $100,000. According to the county, approximately 120 people work in the office and are now working from alternative locations until the building reopens. “I can't believe somebody just drove into the front of the building. Thank God nobody got hurt,” DeMatt told NBC 7. The county said the Housing and Community Development Services offices would be closed until further notice due to the crash. The entrance has been blocked off with plywood. The county said those with appointments should call (858) 694-4801. The nearby North Central Family Resource Center at 5055 Ruffin Road would be available for those in need of immediate assistance. 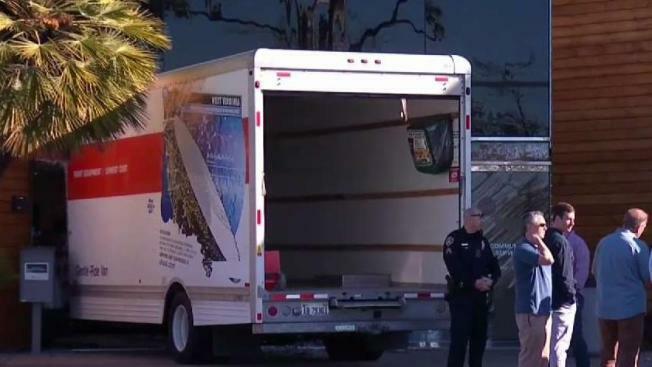 "U-Haul is collaborating with federal authorities in San Diego as they investigate an incident at the County Housing and Community Development Services Office on Ruffin Road. U-Haul maintains a robust investigations unit and works closely with federal and local authorities, as well as others in our industry, to continuously guard against wrongful activity involving rental equipment," Sebastien Reyes, VP of Communications at U-Haul International told NBC 7.